Research Question: What determines the trend in initiation of breastfeeding among lactating women? Objective: To assess the role of various factors in determining the initiation of breastfeeding among lactating women in block R. S. Pura of district Jammu. Material and Methods: A stratified two-stage design with villages as the primary sampling unit and lactating mothers as secondary sampling unit. Villages were divided into different clusters on the basis of population and sampling units were selected by a simple random technique. Results and Conclusion: Breastfeeding is almost universal in R. S. Pura. Education is a key determinant of early initiation of breastfeeding although there is slight variation between rural and urban areas. Objectives: The objective of the study was to find the prevalence and pattern of tobacco use, exposure to tobacco prevention activity among adolescent from tribal area. Materials and Methods: A cross-sectional study was conducted in six tribal villages. Data was collected by interview from 240 adolescent by home visits. Results: Prevalence of tobacco use (all forms), smokeless tobacco use and smoking in tribal adolescents were 54.45%, 53.41%, and 23.14%, respectively. Prevalence of tobacco use in boys (66.25%; 95% Confidence Interval (CI) = 60.29-72.21) was more than girls (26%; 95% CI = 25.84-37.57). Prevalence of tobacco use was more in late adolescent period and earning adolescents. The average age of starting smokeless tobacco use and smoking was 13.75 years (SD 2.26) and 14.22 years (SD 2.54), respectively. Boys start smoking relatively earlier than girls (P = 0.04). Education shows significant protective effect on tobacco use. Bidi was commonly used for smoking, while pan masala and gutka were the preferred smokeless tobacco. Almost all smokers were also using smokeless tobacco. Around 69% adolescents from the tribal area have heard of the tobacco prevention message, but only three could interpret it correctly. Radio and television were the commonest modes of information. Conclusion: Considering the high prevalence of tobacco use among tribal adolescents, anti-tobacco activities need to scale up for tribal people, with more emphasis on behavior change through group or personal approach. School programs may have some limitation in tribal area due to high school dropout, and low enrolment. Prevention activities need more focus on smokeless tobacco use and bidi smoking. Context: Characterization of severe malaria cases on arrival to hospital may lead to early recognition and improved management. Understanding of symptoms, signs, and laboratory parameters which are associated with high case-fatality rate (CFR) can help in appropriate and early management of cases. Aims: To study the profile, symptoms, signs, and laboratory parameters of malaria death cases. Materials and Methods: Information about deaths due to malaria, as reported to malaria Department of Ahmedabad Municipal Corporation by three municipal corporation hospitals and civil hospital Ahmedabad between January 2007 and December 2007, was used to locate details of those deaths in respective hospitals. Indoor case papers and death reports of those cases were obtained from Medical Record Section of respective hospitals and were analyzed by using appropriate statistical software. Results: A total of 57 malaria deaths occurred in the abovementioned four hospitals. Overall CFR was 3.03% for indoor malaria cases. Complete information could be obtained for about 42 cases. Mean age of cases was 36.50 years. There were 45.23% of patients falling in the age group >=40 years. There were 57.1% males and 42.9% females. Fifty-five cases were positive for Plasmodium falciparum, one case for Plasmodium vivax, and one case was having mixed infection. Average duration of hospital stay was 2.87 days and average total duration of illness was 6.82 days. The most common presenting symptom was intermittent fever with vomiting and altered sensorium in 38.88% of cases. Acute renal failure was the most common complication seen in 45.2% of the cases. Paired t-test was applied on the investigations carried out on the day of admission and those carried out on the day or before a day of death and found significant for the levels of hemoglobin, blood urea, and serum bilirubin. Conclusions: Malaria still remains one of the important causes of admission and mortality. In view of changes in antimalarial drug policy artemisinin combination therapy and accurate, rapid diagnostic tools are necessary to target treatment to people in need. 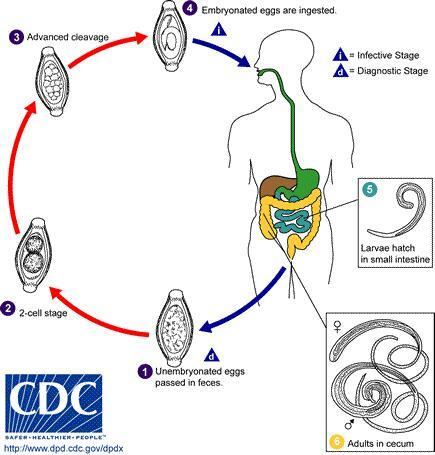 In the state of Maharashtra, India, in the three years 2004-05 to 2006-07, animal Trypanosoma parasites T. lewisi and T. evansi resulted in human illnesses in three different geographical regions. The first two cases have already been reported. The recent case was a man aged 57 years, residing in a small village in district Pune. Since September 2006 he had chronic intermittent fever, anemia, firm hepatosplenomegaly and edema on feet. The investigations in March 2007 revealed that it was a case of T. lewisi. The primary epidemiological investigations showed no other cases in the village. The investigations pointed to the probability of transmission through rat fleas. The case was brought under Suramin treatment in the B.J. Medical College and Sassoon General Hospital Pune. The patient expired after second dose in June 2007. His blood was sent for genetic study in the School of Health Sciences, University of Pune. The genetic study for mutation in the APOL 1 gene revealed that the four DNA fragments from the patient did not have any mutation in the amplified exonic fragments. Aim: To identify the extended-spectrum β-lactamase producing Klebsiella pneumoniae (ESBL-KP) isolated from intensive care unit (ICU) patients of a tertiary care hospital. Materials and Methods: Seventy Klebsiella pneumoniae clinical isolates from ICU patients were screened for ESBL production. All were confirmed for ESBL production by potentiated disc diffusion test. Minimum inhibitory concentrationby agar dilution technique was performed. Sensitivity to other group of drugs was determined by Kirby-Bauer method against ciprofloxacin, amikacin, co-trimoxazole. Results: In all, 74% of the isolates were ESBL-KP; 57% were from blood samples. Coresistance to other group of drugs ranged from 63 to 83%. Conclusion: There is a high prevalence of ESBL-KP. The prompt reporting of ESBL producing bacteria is necessary to prevent their dissemination. This alarms for strict infection control measures to be practised in hospital settings. 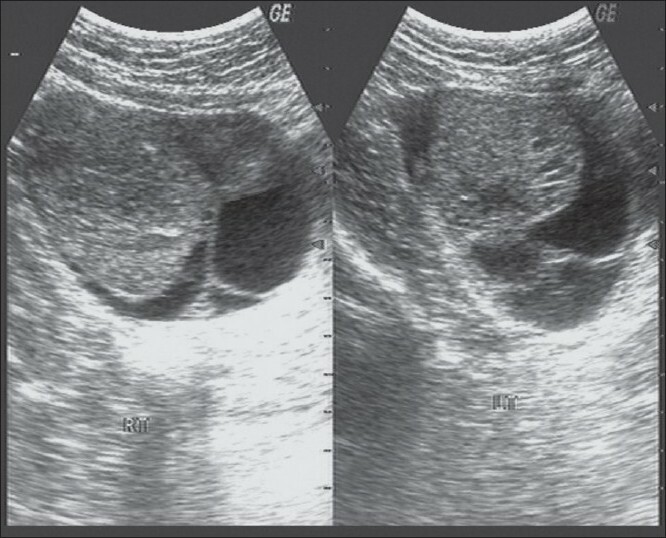 We present a case of bilateral ovarian enlargement with multiple ovarian cysts associated with hypothyroidism in a prepubescent female. The patient was managed conservatively with hormonal therapy. Gastric mucosa-associated lymphoid tissue has a well established pathophysiologic link with Helicobacter pylori infection. Mucosa-associated lymphoid tissue (MALT) is acquired through chronic inflammation/antigenic stimulation in organs which are normally devoid of lymphoid tissue. We report a case of a 65 years old man with a two year history of dyspeptic symptoms associated with gradual weight loss and an epigastric mass. With poor response to anti-ulcer regimens in a peripheral hospital, he was offered a gastrectomy. The histologic report of the mass showed atypical lymphoid cells infiltration of the gastric mucosa up to the muscularis propria. He was promptly commenced on a standard chemotherapeutic regimen for Non Hodgkin's lymphoma, but demised before the second course of chemotherapy. This case highlights the need for prompt endoscopy with biopsy and histologic diagnosis of specimen to shorten delays in diagnosis and improve outcome of patients with gastric mucosa-associated lymphoid tissue. Splenic abscess is a rare entity and occurs after trauma or as a result of systemic bacteremia. Splenic abscess is an uncommon surgical problem in pediatric age group and difficulty in diagnosis in this group is because of rarity, insidious onset, and nonspecific clinical picture. 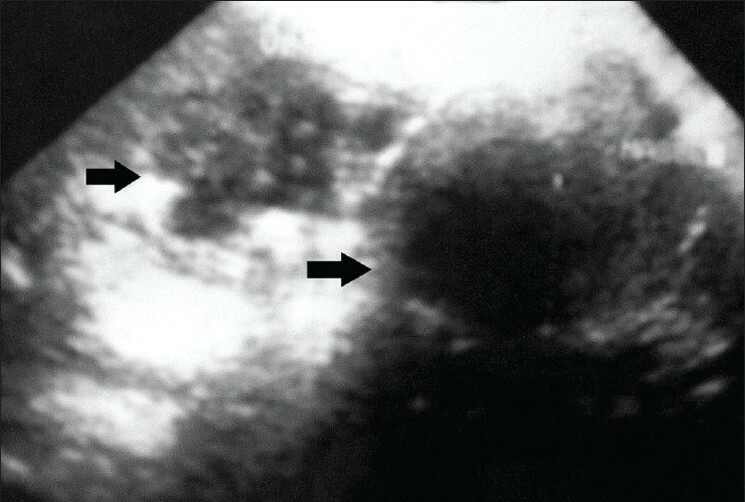 Splenic abscess, found mostly in autopsies and progressing rather fatally, can be diagnosed and treated earlier with the help of recently developed radiological techniques. Patients, as seen in our case, are mostly admitted to the hospital with nonspecific complaints of abdominal pain and vomiting. It has a high rate of mortality when it is diagnosed late. Early diagnosis, prompt treatment, and splenic preservation as a goal in children should be considered unless there are multiple abscesses and nonresponsiveness to conservative regimen. Breast tuberculosis is an uncommon disease with nonspecific clinical, radiological, and histological findings. Investigations such as microscopy and culture are frequently negative, and diagnosis is frequently one of exclusion. We report a case of tuberculous breast abscess in a 46-year-old female case of Carcinoma Maxilla on palliative radiochemotherapy. Equivocal histology, negative Ziehl-Neelsen stain, and culture for acid-fast bacilli resulted in the abscess initially being diagnosed as granulomatous mastitis and treated accordingly. Subsequent development of a discharging sinus and history of immunosuppression raised suspicion of culture-negative tuberculosis. Treatment with standard antituberculous drugs was associated with complete resolution of the breast abscess. This case highlights the difficulty in differentiating culture negative tuberculosis from granulomatous mastitis. Also, the unusual age of presentation following radio and chemotherapy is noteworthy. Acute psychosis induced by INH, especially when given as part of the DOTS regimen, has a variable presentation, and should always be kept in mind in the differential diagnosis. The diagnosis becomes especially challenging when the patient has tubercular meningitis or some other neurological disease. Here we present a case report of a patient who after 2 days of INH therapy under the DOTS regimen developed acute psychosis that resolved only after discontinuation of the drug. 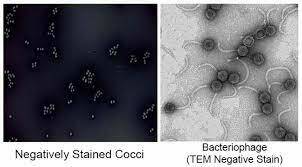 Escherichia coli (E. coli) was isolated from the pleural space of two patients; the first one was a 32-year-old Nepali man who was healthy before, presented with 15 day fever and cough. 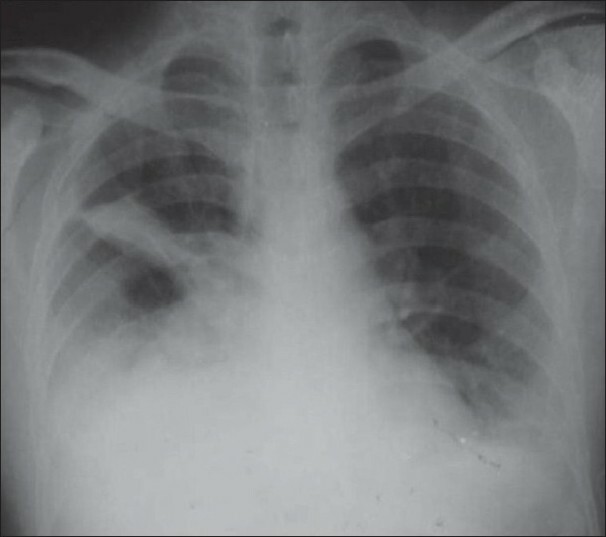 Chest x-ray showed left-sided pleural effusion. After diagnostic workup, he was diagnosed to have E. coli parapneumonic empyema. In addition to the antibiotics and intrapleural streptokinase, decortication was required to improve his condition. The second patient was a 61-year-old Egyptian man who was presented with one-week fever with shortness of breath. He had a history of liver cirrhosis with multiple admissions for decompensated liver diseases. Chest x-ray showed right-sided massive pleural effusion. He was diagnosed with spontaneous bacterial empyema. The patient responded well to fluid drainage and administration of antibiotics; the pleural fluid decreased to minimum in 14 days. 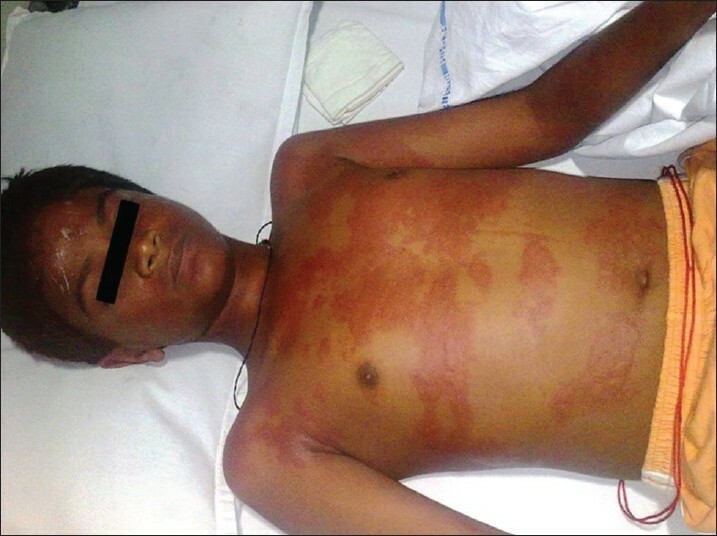 Acute disseminated encephalomyelitis has been rarely reported following leptospirosis. Here, we reveal an adult patient who developed the condition after Leptospira infection, which responded to intravenous steroids. Due to high prevalence of leptospirosis in developing countries, acute disseminated encephalomyelitis should be considered as a possibility in patients presenting with acute neurological disease. Increased awareness of this complication among physicians, and early diagnosis and treatment, may lessen morbidity and mortality. In oncology, vaccination is accepted as an important preventive measure. As a tertiary prevention protocol, several vaccines are recommended for the oncology patients. The newest vaccine in medicine is swine flu vaccine which is developed for prevention of novel H1N1 influenza virus infection. In this paper, the author will briefly discuss on swine flu vaccination for oncology patients. Thromboembolic disorders are one of the disorders for which the researchers are still in search for a safe and efficient drug. Despite the widespread use of antithrombotic drugs for the prevention and treatment of arterial and venous thrombosis, thromboembolic diseases continue to be a major cause of death and disability worldwide. This shows the researchers' inefficiency in searching efficacious and safe antithrombotic drugs. 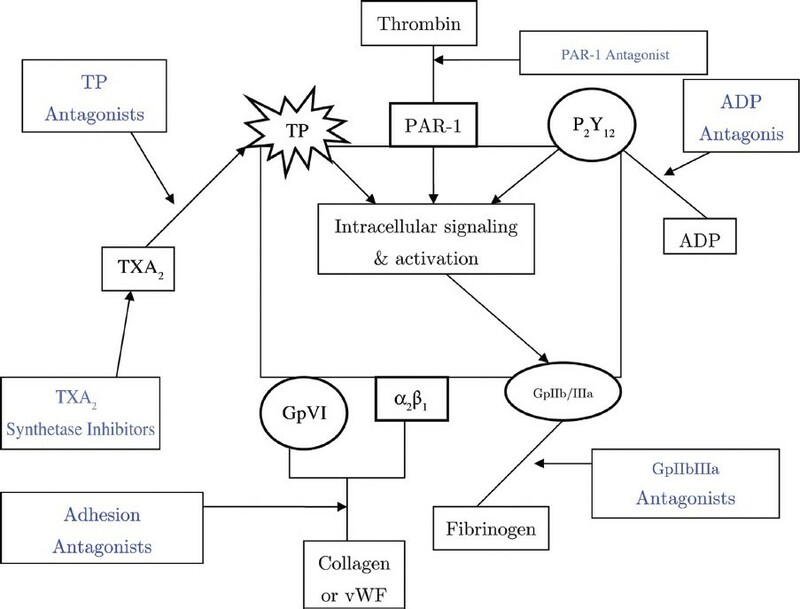 The researchers have reached to the basic mechanism of thrombus formation and by interrupting various steps of this mechanism, they can prevent as well as treat thromboembolic disorders. In continuation of Aspirin, now, the researchers are using clopedogrel, Ticlopidine and GpIIb/IIIa inhibitors (Abciximab, Tirofiban and Eptifibatide). Warfarin is an old antithrombotic drug, which is still being used but due to various side effects and drug interactions, they are bound to use newer drugs. Newer antiplatelet drugs include prasugrel, ticagrelor, cangrelor and elinogrel whereas newer thrombin inhibitors are Ximelgatran and Dabigatran. Apixaban and edoxaban are also newer entry in this category as Factor Xa inhibitors. Idrabiotaparinux is an indirect inhibitor of Xa as it accelerates the activity of antithrombin. Moreover, researches and trials for better and safe drugs are going on. India should have dedicated public health cadre by incorporating high quality training, appropriate career structure and recruitment policy to attract young and talented multi-disciplinary professionals committed to prevention and health promotion. In addition, rewarding good performance and offering continuing professional development are necessary.